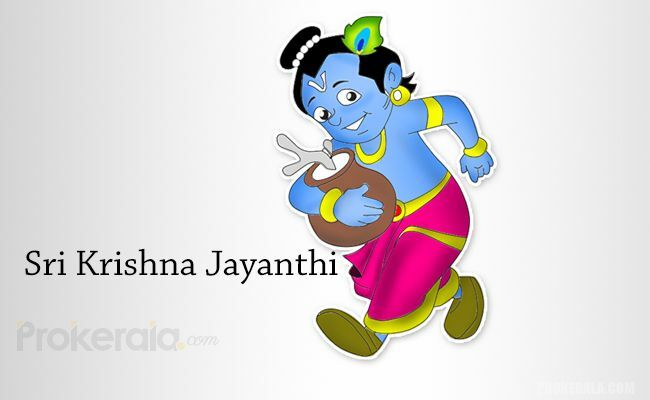 Sri Krishna Jayanthi – Celebration of Lord Krishna's Birthday! Sri Krishna Jayanti is the celebration of the birth of lord Krishna, the eighth avatar of Lord Vishnu on earth. His birth is symbolic of the victory of good over the evil. 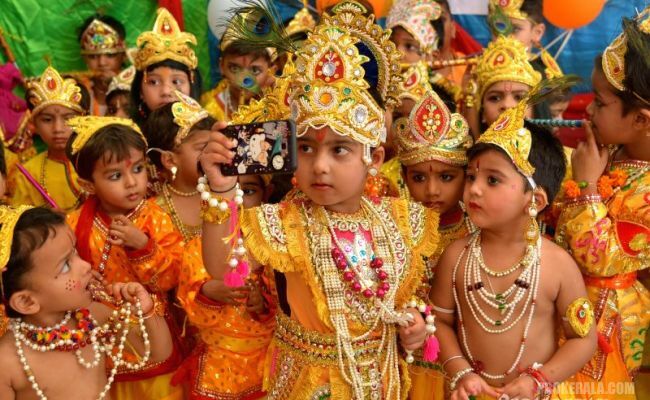 On this day, all devotees of Krishna offer prayers and various kinds of rituals are held in different parts of the country which are inspired by the life of baby Krishna. 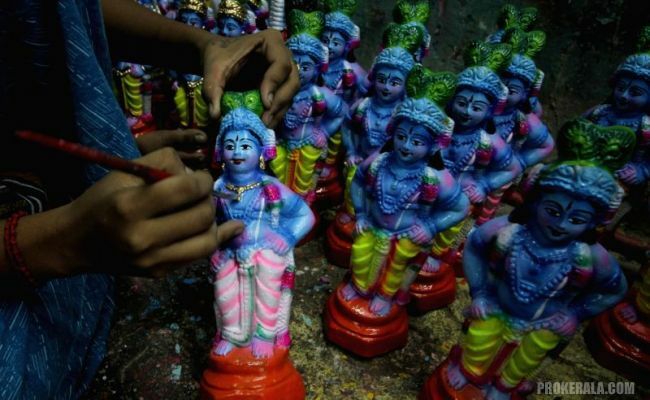 When is Sri Krishna Jayanthi celebrated? Sri Krishna Jayanti is celebrated on the eighth day of the Krishna paksha in the month of Shravaana according to the Indian calendar. According to the English calendar, it usually falls in the month of August or early September. According to mythology, Krishna was the eighth child of Princess Devaki and her husband Vasudeva who belonged to the Yadava clan of Mathura. Devaki's brother Kansa, who was the king of Mathura at that time, killed all children that were given birth by Devaki in order to prevent him from a prediction that said that Kansa would be killed by Devaki's eighth son. When Krishna was born, Vasudeva took baby Krishna to his friend's house in Gokul, a district in Mathura. Thereafter, Krishna was brought up by Nanda and his wife Yashoda at Gokul. This holy day is celebrated in different parts of India according to various kinds of local traditions and rituals. People across the country who celebrate Sri Krishna Jayanti keep fasts on this day until midnight when Lord Krishna was born. As a symbol of His birth, the deity's idol is kept in a small cradle and prayers are offered. Bhajans and Bhagvad Gita recitals are done on this day. In Maharashtra, Dahi Handi is organized on local and regional scales. A human pyramid is formed in order to break an earthen pot filled with buttermilk. There is huge competition and prizes worth lakhs are announced as rewards for these events. In Uttar Pradesh, devotees in large number visit Krishna temples in the holy cities of Mathura and Vrindavan on this day. In Gujarat, this day is celebrated with pomp and glory in the Dwarkadhish temple situated in the city of Dwarka that was lord Krishna's kingdom when he became a king. In Jammu, kite flying is organized on this day. Even in Manipur, this day called Krishna Janma is celebrated at the ISCKON Temple in the state capital of Imphal. In Eastern India, Janmasthami followed by Nanda Utsav the next day is characterized by keeping day long fasts and offering different varieties of sweets to the Lord at midnight thus celebrating his birth. Important pujas are held at Puri in Odhisa and Nabadwip in West Bengal. In Southern India, women decorate their houses with small footprints made of flour representing the life of baby Krishna stealing butter.